Retailers, Franchises, Grocers and Brands. AppCard is a data-driven loyalty, personalized marketing and customer retention solution. AppCard uses artificial intelligence to help your business gain truly actionable insights into your customers every time they shop. Machine learning and proprietary algorithms help small- and mid-sized retailers, independent grocers and brands deliver the right message to the right customer at the right time – increasing sales and delivering a higher ROI on every marketing dollar spent. AppCard’s comprehensive customer retention solution features easy-to-use tools and analytics that increase your competitive advantage. AppCard gives multi-location businesses like QSRs and retailers the tools to consolidate reporting and deliver personalized offers at scale. Digital coupons and flexible loyalty programs from AppCard give independent grocers the tools to compete with the big guys. Your loyalty program is only as effective as the amount and accuracy of data the you can capture. 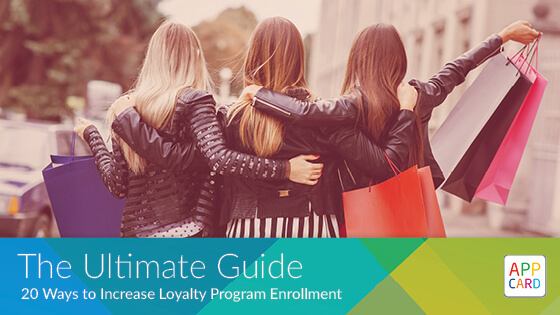 Discover how to design desirable rewards programs, attract your customers’ attention and incentivize your staff to increase loyalty program enrollment.